Home » Raising Chickens Update: Is It Worth It? Chickens love to eat — they’ll stuff themselves silly, if you let them. One of our cousins couldn’t figure out why his chickens laid down to eat…turns out they were so fat, they couldn’t stand up for any length of time! Our chickens will eat anytime, anywhere, and as much as we let them. Molting, the nasty secret of chickendom, kicks in during spring or summer, and can last for weeks. During that period, the chickens lose some of their feathers, and cut way back on laying — or not at all. Which means you’re feeding them (see above), but nothing much is happening. Not just to each other, but to you. If they don’t want to give up their eggs (who would…it’s their kids), they won’t hesitate to peck you. If you’re firm and reach in, anyways, it’s generally ok — but not fun. They’ll swarm around you and trip you. They’ve even chased our dog, hoping to grab his bone. They don’t show much affection or gratitude. They push and shove each other around. Chickens would make great terrorists…they just don’t care. If they were much larger, we’d be in big trouble. Or a fox may decide to stop by for the buffet. In that case, you can lose months of feeding and care — and income — in just a minute or two. And they don’t care if it’s on your concrete walk, instead of the yard, where it could be doing some good. That means lots of great compost for your garden! No more throwing away spoiled vegetables, or the casserole you just can’t stomach for the umpteenth time. They’ll eat it – and give you eggs. If you just keep hens, you’ll have some occasional announcements — but by and large, they just cluck quietly. Like the poop business, this fault of chickens is also their strength. 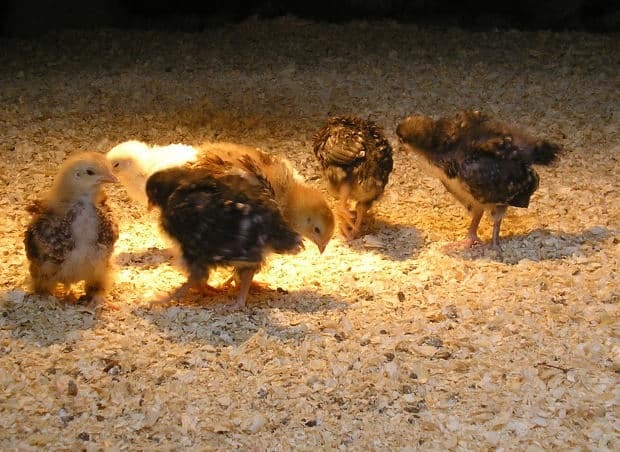 They may devote more time than you’d like to roosting on top of the coop, instead of in it. They may ferret out holes in the fence, or figure out where the feed is kept, and help themselves. But they’ll also hide in the trees and bushes when a predator comes, keep themselves clean with regular dust baths, and be surprisingly easy to care for, as long as you’ve got feed, water and a warm, well-ventilated place to stay. We put in a heat lamp when it gets chilly, but have heard of others who just put in a regular lightbulb. They seem to enjoy the warmth, but it’s certainly not critical. And that’s at 6250 ft altitude, where we get regular snow and storms. They don’t even bother to come in, when it’s raining — the chance to snack on worms is just too tempting. Would we get chickens again? Yes, I think so — but we’d do some things differently. For one, we’d build a chickenyard much sooner. (I do want a vegetable garden again!) For another, we’d set up automatic waterers and feeders, instead of trudging out in all kinds of weather to feed them. And watching a batch of clucking birds, feathers shining as they scratch in the warm dirt, while you eat firm, fresh eggs for breakfast…is a real pleasure. I’m so interested in this!! So glad to learn about this, I’ve always wondered if it would be worth it to have your own chickens. I don’t think I could ever do it unless I had automatic feeders though. Also don’t know if I could deal with the mess! You learn how to do it, Janine…this is one of those skills that in spite of reading and as much preparation as you can — you still learn from doing it, day after day. Really, you only need to worry about a ‘mess’ every month, and only for an hour, while you clean out the chicken coop. (And fertilize your garden and flowerbeds at the same time!) If you keep them in a chickenyard, instead of letting them run around your yard, any poop will be kept more contained. We’re in the process of fencing off a large yard for them. (Our entire backyard is enclosed with 6′ wire fencing, which has made it easy to put this off. But my perennials and garden have paid for it…) After the first frost, though, it’s not that big a deal to let them run loose at least a few days a week. They really are great scratcher-uppers, and have cleaned out the weeds nicely. We normally close the coops up at dark, to help protect the chickens. (We have coyotes and other predators around here, including a large neighborhood fox.) And normally, our Golden Labs stay outside until dark, as well. One night, because one of our dogs was having such trouble with allergies, we kept both dogs inside. Unfortunately, Mr. Fox chose that night to visit. We lost two of our babies — just as they were starting to lay. I guess I should be grateful he didn’t kill more. Since then, we are very careful to keep the dogs outside every night until the coops are closed up…much to their dismay. But we haven’t lost any more chickens. Thanks for writing. It definitely is worth it, hassles and mess and all, to raise chickens! My goal from the start was to sell enough eggs to pay for the hens’ feed — in effect, giving us ‘free’ eggs, if you don’t count the expense for wood for their coops. And that has worked very well. They’ve even ‘paid’ for some of the coop expenses, too.